No, really! From one cranberry addict to another, this sauce is mindblowing. I am absolutely smitten. In love. Addicted. Obsessed. Love-it-so-much-I-should-marry-it. If I could possibly be any more emphatic in my praise of this recipe, I would, but I feel like shouting in all caps about HOW UNBELIEVABLY AMAZING this recipe is seems, well, obnoxious -- which completely defeats the purpose! This sauce rocks my socks, people, and very few recipes can do that. It's that good. So now, I have to share it with you. Understand, I don't share very well - and particularly not culinary creations that I have slaved over prepared. I love entertaining and cooking for family and friends, but when I find a recipe like this -- like finding a diamond in the rough -- and I prepare it, late at night, just for me -- well, sharing isn't on the menu. But you see, if I share it with you, then not only will I no longer be alone in my delight, but it's the type of sharing that doesn't involve me giving up any more of this heaven-sent sauce than I have to -- unless you request I ship it to you, in which case, I flat out politely and respectfully decline. Here it. is. 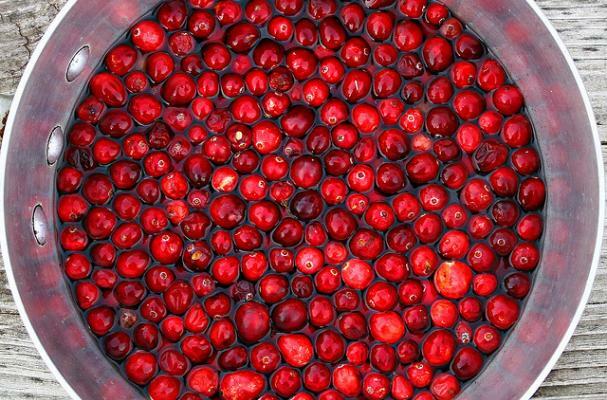 The best cranberry sauce of your life -- and probably the easiest, too. Not too sweet, not too tart, and with a complex blend of flavors that could rival any 5-star kitchen. Think mulled wine + cranberries + a little kick from the ginger. Wow. Wow. Pour stuff in pan, heat, stir, devour. Ready in 20 minutes - swear on my sauce! Really, it's that easy. Psst! Use this addictively delicious sauce in my Gluten Free Cranberry Almond Bundt Cakes! This recipe is naturally gluten free, milk / dairy free, soy/corn/peanut/tree nut free, eggless and vegetarian / vegan. Holy cow - basically, everyone can love it! In a 1 Qt saucepan, combine wine and sugar, stirring well. Add cinnamon sticks and ginger. Bring to a boil over medium heat, stirring to dissolve the sugar. Reduce heat to medium-low and simmer for 5-7 minutes, or until the liquid begins to reduce a little bit. Add cranberries and continue to simmer for 12-15 minutes, or until cranberries are soft / breaking apart and the sauce begins to thicken. At this point, you can be done - skip to the bottom and enjoy! Or... Mash your cranberries with a sturdy whisk / potato masher thing (I don't have one, but I imagine it would have been awesome), just to break up the cranberries and simmer for another 5 or so minutes to thicken a little bit more. In a 9×13-inch oven-safe glass / ceramic baking dish, stir together everything but the booze bourbon and OJ. Cover with foil and bake for 30 minutes; stir well to dissolve remaining sugar -- and make sure you get to the corners! Continue baking another 30 minutes. Remove from oven, stir in bourbon and OJ then allow to cool. Serve warm or at room temperature; refrigerate up to one week. Ha! oh wow, what a 'DUH!' moment! I added the bourbon recipe - so sorry! You are right. I totally agree with you. What a gorgeous photo, and you've convinced me about the cranberry sauce. I just made a great hot pepper cranberry sauce, but I was wondering how a spiked version would be. I'll try this for sure.